Planetary "like" with ball bearing aluminum gearbox for S-400 and S-480 long can motors. Includes pinion for your motor with 2.3mm shaft. Output shaft diameter is 5mm. It's actually got an offset counter-shaft inside and is not planetary but certainly apears to be from the outside. Like Planetary, your shaft stays on center. Will fit in glider nose or tight cowlings nicely. New version with 4mm output shaft. Fits all 20 mm Brushless motors with 2mm shaft. Built-in cooling fins for cooler motors. 10mm x 10mm mounting box fits most planes designed with GWS gearboxes and any 10mm (3/8") square sticks. Comes with complete gear set assortment including 6.6:1, 5.3:1 & 4.4:1. All included pinions are for motors with 2mm shafts. Dual ball bearings and hardened shaft. Astro Micro Gear Box #709 Fits Astro 010 motors. The New Astro Micro Box for the Astro 010 brushless motor weighs only 1/2 ounce and fits all Astro 010 motors. The Gear ratio is 3.3 to 1 and it spins props from 8x6 to 10x7 on 8 to 10 NIMH cells or 2 to 3 lithium poly cells. 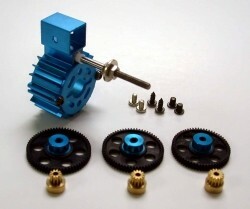 The Gear Box is mounted to the motor with two screws and is mounted to the model with a single nut on the threaded barrel of the bearing housing right behind prop. Nothing could be simpler! The motor in this photo is for illustration only and is not included at this price. Planetary ball bearing gearbox for S-400 standard and S-400 long can motors.Comes with pinion for your motor with 2.3mm shaft. Output shaft diameter is 4mm. These gearbox's are very very smooth and quiet unlike other very similar looking units. Also works with brushless motors which have holes drilled to mount S-400 gearbox's such as the Chili Peppers, Himax 2015 and 2025 series motors. If you have a 20mm inrunner, it should bolt to this gearbox. Included pinion is for 2.3mm shaft only. Planetary ball bearing gearbox for genuine S-480 motors. Comes with press on 3. 2mm bore pinion. Output shaft diameter is 4mm. These gearbox's are very very smooth and quiet unlike other very similar looking units. Warning! Long can 400's with 2.3mm shaft use the S-400 gearbox. Planetary ball bearing gearbox for S-500 thru S-600 motors. 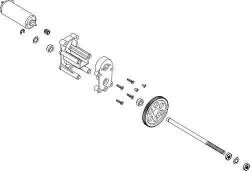 Comes with pinion for your motor with 3.2mm shaft. Output shaft diameter is 4mm. These gearbox's are very very smooth and quiet unlike other very similar looking units. Fits all 24 mm Brushed motors with 2mm shaft. Direct replacement for most plastic gearboes. 10mm x 10mm mounting box - fits most planes designed with GWS and other stick mount gearboxes. Aluminum gear housing - no more broken gear housing. Built-in cooling fins - no more overheated motors. Multiple gear ratios - 6.6:1, 5.4:1 & 3:1 gears included. Dual Ball Bearings with hardened shaft - efficient and durable operation. 3 mm threaded shaft for GWS props. Use band of tape to space up 280 motor for perfect centering, others direct fit. Replacement gearbox frame only for IPS single motor. The two pieces and mounting screws in middle of exploded view. If you want a smooth and quiet gearbox, search no further. Improve gearbox efficiency, output torque and RPM. 1g packet of thin, clear lubricant. Correct lube for electric flight gearbox applications. Also good for inside of servos. Enough for 2-10 applications, depending on size of your gearbox. A tiny bit goes a long way. Fits all 20mm to 28mm brushless motors with 2 or 4 bolt mounting pattern on face (99% of everything ever made?). This is a heavy duty box (up to a Hacker B-40). Fits traditional 10mm x 10mm stick mounting box, fits most planes designed with GWS gearboxes also. Output shaft is a stout 4mm. Comes complete with aluminum prop adapter and mounting screws. Choose from popular gear ratios below. 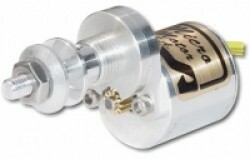 Included pinion is 2.0 mm bore. Other Pinion sizes and bores available in Gearbox Parts (a subcategory of the Gearbox category your in now). Notice that since the motor may be pivoted for gear lash adjustment that many other ratios may be attained with other pinions and spurs. Rugged 4mm shaft works with all GWS EPS 400 spur gears (Listed in "Brushed Motors" sub category "GWS Motor System Parts") for an even wider range of gear ratios than stock listed below. Fits all 20mm brushless inrunner motors with 2mm shaft. Aluminum gear housing with heat sink, stick mount. 10mm x 10mm stick mounting box - fits most planes designed for GWS type gearboxes. Photo shows gear already installed. Additional gears included for ratios 6.6:1, 5.3:1 or 4.4:1. Setup with any of provided gears to build ratio desired. 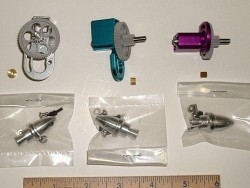 Aluminum prop adapter, motor mounting clamp screws and two allen wrenches included. 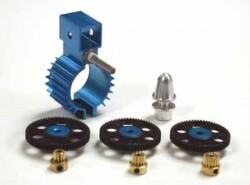 Compatible with HiMax set-screw style gearbox spur gears and pinions as well as GWS press on pinions. Main gearbox shaft is not splined so only set-screw secured spurs may be easily secured to it (Himax spurs fit). Choose from options as to color and which gear is already installed in options below. 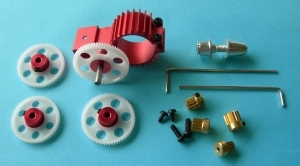 Correct gear to adapt your 2mm shaft motor (like many 20mm inrunners) into our 3.8:1 planetary gearbox. Width .199" (5mm). 15 tooth. Modulus/pitch is unknown. It's finer than .6mod and coarser than .3mod. Might be an engliish gear? Proper sun gear for the RRC 3.8:1 planetary gearbox.